All the benefits of the cloud diabetic comfort shoe plus silver. Diabetic comfort shoe with Croslite Ag+™. Ideal for: ultra sensitive feet, impaired circulation, impaired sensation and diabetic feet. Infused with a silver treatment. Super-soft footbed provides a gentle environment for sensitive feet, while the roomy toe box allows for use of a heavy sock without creating any tightness or pressure points on the foot. The protective front toe cap and elevated heel rim protect the diabetic foot from stubbing and bruising. Nano-silver ceramic crystals are combined with croslite material, a unique shock absorbing material that is non-marking, slip-resistant, doesn’t break down, & is bacteriostatic. When this combination occurs, the end result is croslite Ag+. This material which is naturally anti-bacterial, effectively kills harmful strains of bacteria & fungi which are routinely at issue with foot infections, namely bacterial staphylococcus infections & fungal athlete’s foot infections. The anti-bacterial & anti-fungal environment of the CrocsRx Silver Relief & Crocs Silver Cloud can be a critical benefit for those susceptible to such infections. 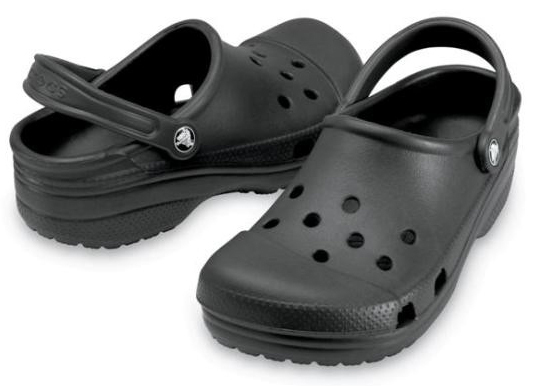 Microbial tests were performed on the Crocs Rx Croslite Ag+ material. The tests concluded that there is a 90% kill rate for bacteria & fungi and is effective for a one-year period of time. Croslite Ag+ works by a slow, steady release of silver ions which maintains an effective concentration in and around crocsrx silver products. The silver ionic release rate is accelerated by three factors: heat, moisture, & saline concentration. In other words, the hotter & sweatier the feet become, the more silver ions are released to fight the increase threat of infection. Croslite Ag+ material is effective with or without socks. Silver ions are extremely small – small enough to penetrate the cell walls of microbes, thus easily penetrating the sock material to reach the skin surface of the foot. Silver is a well-known, time-tested, anti-bacterial agent. Silver is currently used in eye drops, bandages, wound dressings, burn salve, topical ointments, and various other medical & non-medical products as a means of killing a wide range of menacing bacterial, fungal, & viral microbes. Certain medical conditions make a person more susceptible to skin breakdown, foot odor, & infection.